ONLY A FEW DATES STILL OPEN FOR GRADUATION PARTIES! Contact us to plan a customized set-up for your wedding. 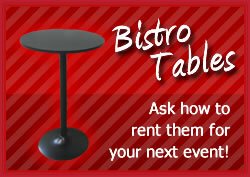 Call 937-381-0977 today to reserve your date and rental package. Schirbyz Party Rental is Miami County’s source for all of your party rental needs, specializing in Tents, Tables, Chairs and Poly Solid Linens. 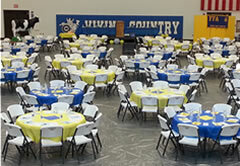 We have all that you need to pull off a successful event. With our outstanding product quality and accommodating customer service, you can be assured that you came to the right place. For peace-of-mind on the day of your event, choose Schirbyz Party Rental. Schirbyz Party Rental offers excellent customer service and quality products with no hidden costs. And with our pre-event set-up and post-event breakdown at no additional charge ($100 minimum rental required), Schirbyz Party Rental makes the logistics worry-free. No carts or racks for you to store or hide — only exactly what you need for you and your guests to enjoy your event. We offer crisp white tents (open or enclosed), sturdy tables and comfortable chairs to suit guest lists of any size. Poly Linens provide the perfect complement to any occasion. They come in a variety of solid colors to make your event. Every event is unique, which is why we’ll meet with you to learn more about your occasion and any special requests you have about the set-up, arrangements or time frame. It’s never too early to book your event — but it may be too late! No deposit required, and no cancellation fee as long as you contact us at least seven days prior to your event. ASK US ABOUT ROPE LIGHTS! Comfortably seat six to eight people! Please contact us BEFORE you mail the contract so that we can provide you with confirmation of your reservation and date. © 2016 Schirbyz Party Rental. New Knoxville, Huber Heights, Dayton and surrounding areas in Miami Co., Shelby Co., Darke Co., Montgomery Co. and Champaign Co.!